Definition at line 32 of file regex-matcher.hpp. Definition at line 41 of file regex-matcher.hpp. Definition at line 28 of file regex-matcher.cpp. Reimplemented in ndn::RegexComponentMatcher, ndn::RegexComponentSetMatcher, ndn::RegexTopMatcher, and ndn::RegexRepeatMatcher. Definition at line 42 of file regex-matcher.cpp. Definition at line 65 of file regex-matcher.hpp. Definition at line 71 of file regex-matcher.hpp. 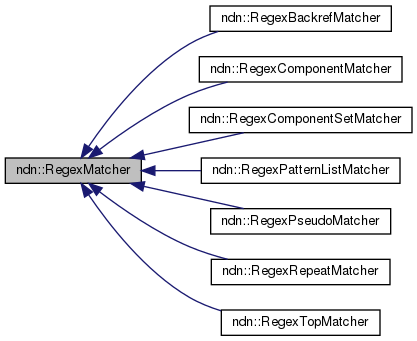 Implemented in ndn::RegexTopMatcher, ndn::RegexComponentMatcher, ndn::RegexComponentSetMatcher, ndn::RegexBackrefMatcher, ndn::RegexPseudoMatcher, ndn::RegexRepeatMatcher, and ndn::RegexPatternListMatcher. Definition at line 88 of file regex-matcher.hpp. Referenced by ndn::RegexPatternListMatcher::compile(), ndn::RegexRepeatMatcher::compile(), ndn::RegexBackrefMatcher::compile(), ndn::RegexComponentMatcher::compile(), ndn::RegexComponentSetMatcher::compile(), ndn::RegexTopMatcher::compile(), getExpr(), and ndn::RegexComponentMatcher::match(). Definition at line 89 of file regex-matcher.hpp. Definition at line 90 of file regex-matcher.hpp. Referenced by ndn::RegexRepeatMatcher::compile(), ndn::RegexBackrefMatcher::compile(), ndn::RegexComponentMatcher::compile(), and RegexMatcher(). Definition at line 91 of file regex-matcher.hpp. Referenced by ndn::RegexRepeatMatcher::compile(), and ndn::RegexBackrefMatcher::compile(). Definition at line 92 of file regex-matcher.hpp. Referenced by ndn::RegexTopMatcher::expand(), getMatchResult(), ndn::RegexRepeatMatcher::match(), ndn::RegexTopMatcher::match(), ndn::RegexComponentSetMatcher::match(), ndn::RegexComponentMatcher::match(), match(), ndn::RegexPseudoMatcher::resetMatchResult(), and ndn::RegexPseudoMatcher::setMatchResult().